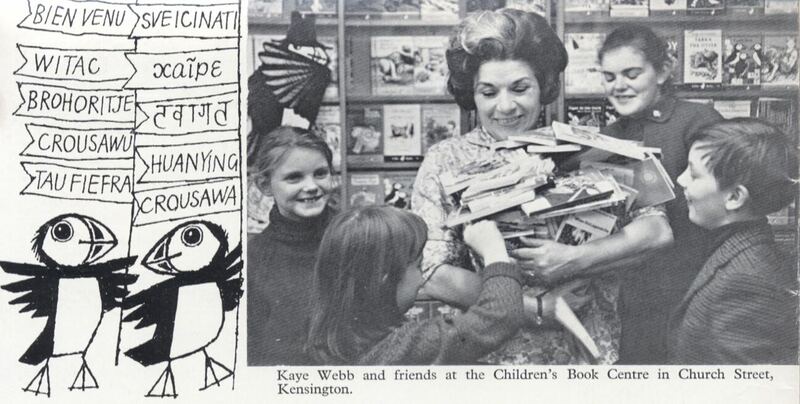 The Puffin Club was the groundbreaking venture launched by editor Kaye Webb in 1967 that changed children’s books forever. The club broke down the barrier between authors and young readers, bringing them together at Puffin parties and in the pages of Puffin Post. Webb helped create the world our children our now lucky enough to inhabit, with its laureates, festivals, book days and never ending magic roundabout of author events. I asked two people involved in the club about their memories of Puffin Parties, the unique Kaye Webb and whether her club should be revived. Philippa Dickinson, began as an office junior and event organiser and went on to become Managing Director of Random House children’s books. She was Terry Pratchett’s editor and was a key part in the launch of the Fighting Fantasy game books. Lizza Aiken is a writer and the curator of her mother Joan Aiken’s estate. How did you get involved with the Puffin club? Lizza: My mother Joan Aiken had published the first books in her ‘Wolves Chronicles’ series – The Wolves of Willoughby Chase and Blackhearts in Battersea. When Kaye Webb took them for Puffin Books in 1968, the two became great friends, and Kaye invited me to come and work for the Puffin Club (which had started the previous year) when I left school for my gap year in 1968. What was your role? 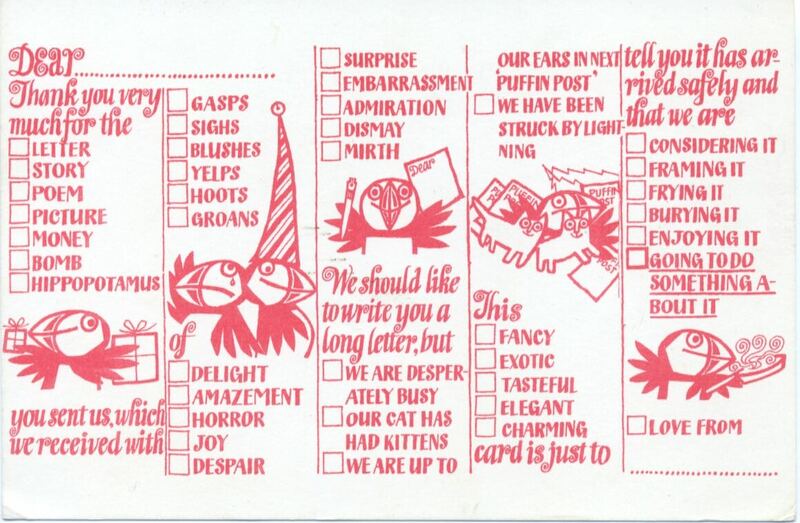 Lizza: One of my jobs was to send replies to Puffin members who wrote in – we had multiple-choice postcards designed by the wonderful Jill McDonald that you only had to tick or cross, so every child got an answer. The office was total chaos, quite a small room in the enormous Penguin warehouse out at Harmondsworth. Kaye was always getting people in to help, and quite often leaving them in the lurch or handing them on to someone else. One day when everyone was out I tidied up – not a good idea – the response was general horror. What’s your fondest memory of the Puffin club events? 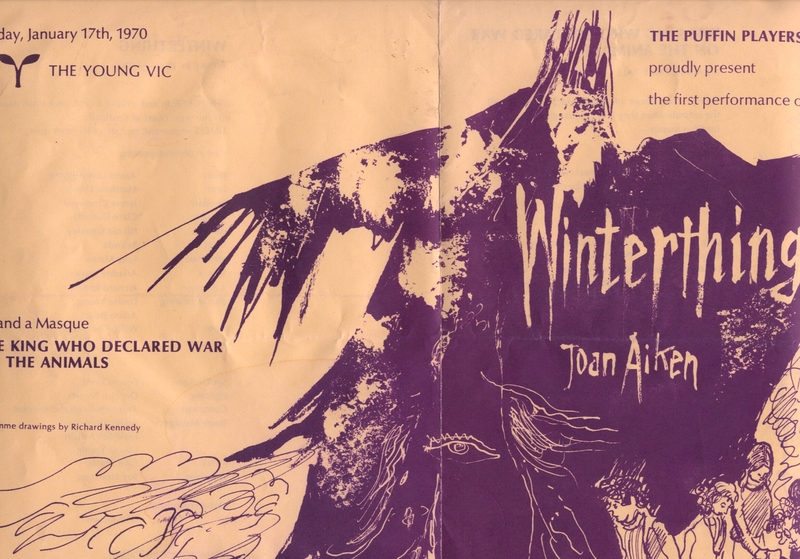 Lizza: In 1970 Kaye started the Puffin Drama group, and asked Joan Aiken to write a play for them to perform, it was called Winterthing. There were far too many applicants and I was by then studying drama at University so Kaye invited me to fill the second half of the bill and direct a fairy tale with the left over dozens of children – she never like anyone to be disappointed! It was called The King who Declared War on the Animals and opened at The Young Vic in 1971 with a set and costumes largely made out of cardboard by me and the cast…it was a huge success! Did Joan enjoy being a part of it? 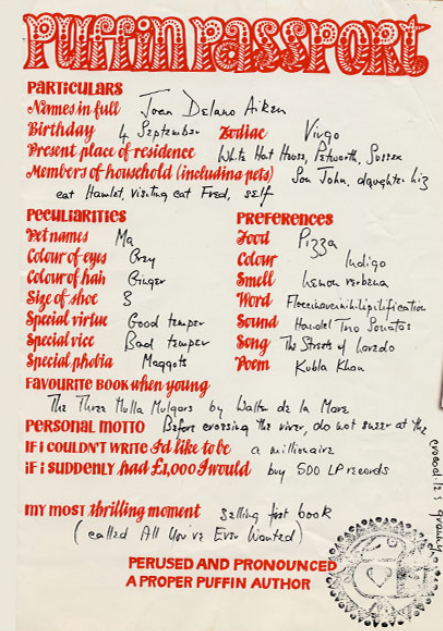 Lizza: Joan Aiken was a very shy and retiring person, and was at first aghast at Kaye’s expectations that she would turn out and be jolly on all occasions, but she loved meeting her readers, and hearing their feedback, and after a year or so was happily dressing up as ‘Madame Arkana’ and telling fortunes, or joining picnics and treasure hunts all over the country. At one firework party she lit the bonfire, and my brother was persuaded to play music and lead the singing. Joan loved that Kaye liked to involve not just her writers but their whole families. It also meant that she met many of her contemporaries before Literary Festivals and other social networking systems existed – writing was otherwise a very solitary career. What did Kaye Webb bring to the club? Philippa: Kaye was the Puffin Club. It was her vision, her baby. She knew how children’s literature fired kids’ imaginations and provided an outlet for and celebration of that creativity. I also learned from Kaye that quality was important and that kids have enormous capacity to take on big ideas and complicated concepts. Lizza: Enormous enthusiasm, warmth, passion for books and authors – encouragement for the authors themselves – she was a one-woman PR team for so many of the up and coming writers of the sixties in a way that publishers had never been before. Children adored her, and always looked for her personal message in the front of each Puffin book. She made reading cool, and the club a whole social world for its members. Why did the club end? Philippa: I wasn’t involved in the decision to close the original Puffin Club but I imagine that Penguin decided that it was rather expensive to run. I have a feeling that membership numbers had been going down, Cost of subscription was going up – and there were other ways for kids to spend their time and pocket money. 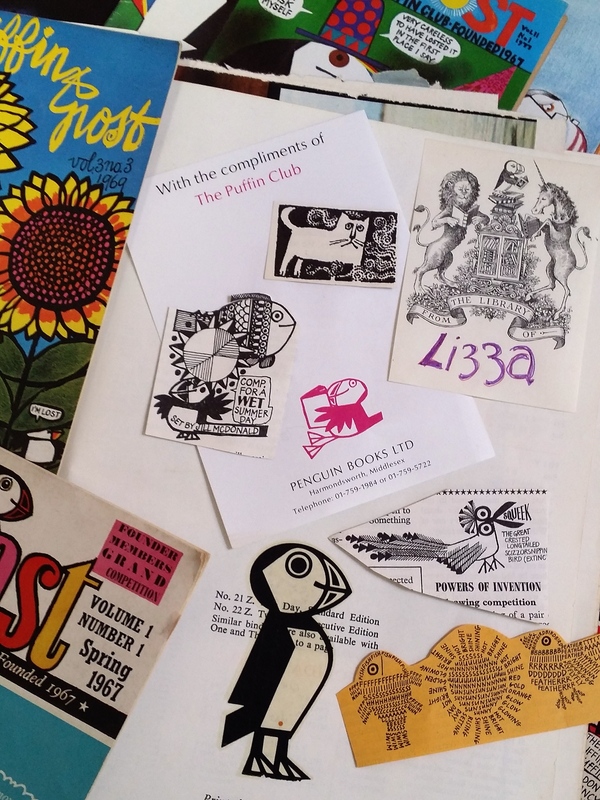 Lizza: The loss of Jill McDonald in 1981 was a huge blow for Kaye, they had worked on Puffin Post together for over ten years, and Jill’s art formed a huge part of the Puffin Club ‘brand’ – her style had been hugely influential in the sixties. Kaye was beginning to suffer from very severe arthritis, she prepared to hand over to a new team and she retired the following year Do you think it would it be possible to launch such a thing now? Philippa: There are so many other potential outlets for kids’ creativity these days. Online, school, World Book Day, Children’s Laureate projects… Running a club for kids is incredibly time-consuming and resource hungry. Kids expect a reply to every letter or message they send – and a pretty quick one, too. Quite a lot of the author & artist contributions to Puffin Post were not paid (or for a token fee). By the time I left, it was more normal to offer a fee but at the beginning, I believe most contributors did it for free – and because Kaye asked them to do it. They did it for her. I suggest that anyone who is thinking of launching another club along those lines talk to the people hosting what is left of Young Writer Magazine and/or the team behind the Phoenix comic. I think it could be done but it wouldn’t be easy and you would need to have a serious amount of financial backing from people who would not expect much return on their investment for a good long time (if ever). Lizza: I’m sure it would be very welcome – an extension of some of the social media/ book blogging sites that exist now, but for younger readers and contributors. It could use the input of someone like Jill McDonald to give it a visual identity – and someone like Kaye to enthuse and keep everyone on their toes! 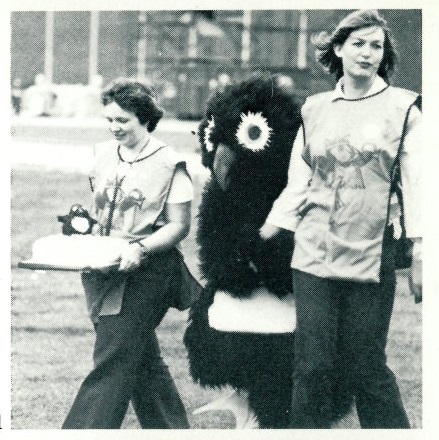 Many thanks to Lizza Aiken and the Puffin Club Archive for the images. You can read more on the Puffin Club in this accompanying piece for Middle Grade Strikes back – Kaye’s World: Puffin Club Forever. Tags: Jill McDonald, Joan Aiken, kaye webb, Lizza Aiken, Philippa Dickinson, Puffin Club, Puffin Post, The Wolves of Willoughby Chase. Bookmark the permalink. Nicely put together! Thanks for the namecheck! There’s more of your stuff now up on this blog – Kaye’s World: Puffin Club Forever! So lovely to see all these things again, if nothing else I love the design and the fact that you could own these bits of Puffin fan ephemera. I’m a bit sad my son lives in such a digital age sometimes! A really good read, thank you. Lovely timing – Wolves of Willoughby Chase is coming out as a Puffin Book again soon – she would be proud to be back! I just posted you on The Joan Aiken Page too – Thank You! The Puffin Club was hugely influential and it was very exciting when the Puffin Post dropped on to the doormat. Everything was executed well and thoughtfully and all my books had Puffin Club bookplates on the flyleaf. I was in the original production of The Winterthing at the Young Vic. Joan’s son John taught me to play the guitar for it. A kind, patient man. We only ran for one performance and I remember cocking up one of the songs and feeling bad that I would never get another opportunity to rectify it. It was an extraordinary experience. Kaye was strict, kind and had huge charisma. At the party at Kaye’s home afterwards she arranged a huge number of books around her flat and told us that we could choose a book to take away as a thank you. It was only when I got home that I read the inscription on the flyleaf; it was a copy of How to be Topp with a loving message to Kaye from (only just) ex-husband Ronald Searle. When I handed the book back she, typically, handed me two books in return. Hi Matthew, Yes you were Lem! So lovely to hear kind words about my brother John, he also taught my daughter to play guitar so I know about his patience…he used to get furious with himself for cocking things up though, so don’t feel badly! I loved the songs he wrote for Winterthing and still have some of them on tape…the Beaufort Scale wasn’t easy to play or sing! Joan had some wonderfully wacky ideas but he wrote lovely tunes for her. Hello Lizza, Yes I was Lem. Did you see that production? It was one of the first productions at the Young Vic with a set made from rope and tie-dye banners that shot out over the audience at the end. The play has an intangibly eerie quality – typical of your mother’s work. I suppose because it is a play it is rarely cited in bibliographies, but it is beautifully written and for boy of eleven was enormously enjoyable to act. When the script was first published in the States and your mother sent me a copy with my name in the front, I felt hugely proud. So we will have met! I remember that play being rehearsed at the same time and had a family friend, Camilla Howell in the cast. It was a terrific time in my life. Thank you for reminding me about it. So pleased this article is bringing back such happy memories. Thanks for getting in touch Matthew.